In 2006, this forgotten treasure of musical theatre was rediscovered in New York, and now it returns triumphantly to Los Angeles where it hasn't been seen in years. The genius of Jacques Brel is beautifully captured in this brilliant collection of timeless songs, songs of passionate desire and heartbreak, of youthful exuberance and world-weariness, of joyful hope and forgotten dreams. As fresh and poignant as ever, Jacques Brel reflects the full scope of what it means to be alive, where every song is a story. "...Musical director Brent Crayon, who also spearheads the wonderful onstage band, elicits powerhouse performances from his musically gifted performers. The design standout of the evening is Adam Blumenthal�s lighting, which is perfectly calibrated to the shifting moods of this brightly burnished production, a must-see for Brel fans and those who have yet to experience Brel�s enduring appeal." "...Brel is essentially a story-teller, and his lyrics (translated by Eric Blau and Mort Shuman) matter, yet here they are often overpowered by the accompaniment. Jon Lawrence Rivera's direction is always professional, though his sometimes over-busy staging (particularly for the men's numbers) can obscure rather than enhance. Musical director Brent Crayon and a four-man ensemble provide stirring instrumental backup, and John H. Binkley designed the handsome, semi-abstract set." "...The show is plotless, but a unifying element in this version is an outdoor funeral setting, eloquently conveyed by John H. Binkley's lovely set design, Adam Blumenthal's breathtaking lighting effects, and Dianne K. Graebner's tasteful costumes. The four gifted actor-singers are Eileen Barnett, Gregory Franklin, Zachary Ford, and Jennifer Shelton. Music director Brent Crayon leads a superb five-member onstage band." 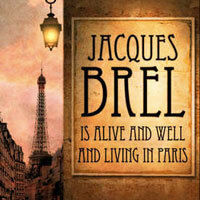 "...'Jacques Brel is Alive and Well and Living Paris' is an action-packed, two-hour musical featuring world-class songs from celebrated singer and songwriter Jacques Brel. It allows audiences to fully experience the incredible range of emotion onstage while sitting in their seats." "...It�s been a long wait for Jacques Brel Is Alive And Well And Living In Paris to make its triumphal return to Los Angeles. Under Jon Lawrence Rivera�s brilliant directorial guidance, the Colony Theatre production proves to have been well worth the wait." "...There are songs of love, songs that reflect death, songs of lament, but above all, songs that will keep you entertained by the lovely Eileen Barnett, the spirited performance of Gregory Franklin, the sumptuous voice of Jennifer Shelton and the double talent of Zachary Ford (who also does some accompaniment on the accordion). The musicians include Brent Crayon (piano), Chris Mello (guitar), Jeff Novack (bass), Oliver Steinberg (bass) and Emiliano Almeida (drums). The English lyrics and additional material are by Eric Blau and Mort Shuman. Jacques Brel Is Alive and Well and Living In Paris is under the direction of Jon Lawrence Rivera, musical direction by Brent Crayon."